“John said to him, “Teacher, we saw someone casting out demons in your name, and we tried to stop him, because he was not following us.” But Jesus said, “Do not stop him, for no one who does a mighty work in my name will be able soon afterward to speak evil of me. For the one who is not against us is for us. For truly, I say to you, whoever gives you a cup of water to drink because you belong to Christ will by no means lose his reward. There are so many important themes in today’s Gospel reading, but we’ll focus mostly on verses 42-48. Because they contain something we don’t hear too often, and something that the world doesn’t want to hear at all. They contain Jesus’ words that we may not be too comfortable with either. That’s why we’ll take a time and look at these verse and their relevance for us today. When we look at these verses we could say that they don’t seem to be too friendly. They have in them the word ‘sin’ four times. Four times in a few verses. What is even worse, they contain the word ‘hell’ three times. And also three explanatory phrases which tell what the hell is like. 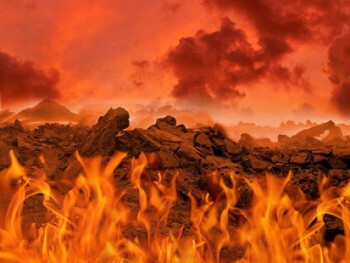 Some may wonder – are we as Christians still talking about sin and hell now in 21st century? Aren’t we too enlightened and knowledgeable to get over these obsolete words? Isn’t Jesus’ message all about love and acceptance and not judging anyone? Recently words like sin and hell, and the message related to them, have been very difficult to swallow to those Christians who don’t trust the Bible as God’s own revelation. When one gets influenced by this message it is difficult to deal with words like sin and hell. In 1980s there was an initiative in US. Group of scholars, who believed in this ‘God without wrath and Jesus without a Cross’ founded what they called Jesus Seminar. One of their projects was to find which words in the New Testament really came from Jesus and which are simply human inventions. How could they know it? Of course, by means of voting. They decided to vote and count votes. So they looked as the New Testament passages and voted: “This seems to be from Jesus. This perhaps was from Jesus. This definitely doesn’t feel like from Jesus.” We can be pretty sure that according to these people, most of today’s reading wasn’t from Jesus. If so then also these verses about sin and hell are inerrant Word of God and infallible source and norm for our faith and life. Let’s look at them and see what can we learn from them, that is relevant for us also today. Let’s think a little bit. Why are these words so difficult for us these days? Sin. Hell. Why? There must be something wrong with our understanding that makes us feel uneasy about these words, and especially about the reality they refer to. There are at least two things that are wrong. First is our picture of God. Second, our focus. First, let’s talk about our picture of God. I think we all are influenced by this totally unbiblical notion of ‘God without wrath and Jesus without a Cross’. Maybe it may seem nicer, but first, it is not true, second it is not even nicer. When people try to create god after their own image and likeness, they think of him as of one of us. Remember, the Triune God, eternal and almighty, He is the Creator. The Creator of the Universe. The One whose almighty word holds everything together. He created everything with a purpose. He created human being in His image and likeness as His representatives to care for His creation. In the Bible He often uses imagery of vineyard talking about His people, and compares people with trees. This image helps us to see things differently. We are not on the same level. No! The Triune God is not one of us. He is holy, eternal and almighty being. Now imagine that you have planted trees in your beautiful garden. You expect the trees to produce fruit. But they don’t. You water them, you fertilize them, you care for them, but… no fruit. Instead, they dry out the soil, they infect and corrupt other plants, they step by step destroy your wonderful garden, everything you care about. What would you do? You cut these trees out and burn them to save and cleanse your garden. It is that simply. It is so obvious a solution. We are like these trees. We are fruitless, we don’t do what we are created to do, we just use everything for our own benefit, and corrupt all that is important for our Creator. What is He supposed to do? If He cares for His creation at all then His is obligated to cleanse it, to purify it from all evil and to restore it in its goodness. He must get rid of all evil that corrupts His good creation. And this is what He is going to do. Jesus uses different picture to describe this reality of God’s purifying intervention. It is not easy to create a unified picture of what the hell is like. There are no analogies in our experience. We can try to summarize it by saying that this will be where there is no presence of God, or His gifts; no peace, no joy, no light, not warms … only pure evil. This will be a place of outer darkness, of fear and trembling, of eternal, unquenchable fire, where their worm doesn’t die. This is how Jesus describes it. Someone may object, but how can a loving God desire something like that for anyone? He doesn’t, because He is loving and caring God. This is where we get to our second thing that is wrong with our thinking. We have a wrong focus. But then he goes on and offers his heart to you, so that you can live. He gives up his life so that only you can live. Now think about this illustration. What is shocking in it? Where is our focus? What is so unbelievable about it? Diagnoses? No! The doctor! He gives up his life for you. Why would he do it? What kind of self-sacrificial action is it? Something that our minds struggle to comprehend. I assume that this is how most people would perceive it. But now, look at the message of Jesus. He tells us in His word that our sin is such a devastating decease that all we’ll die, for the evil of our sin has to be purified, it has to be destroyed once and for all to stop it from destroying everything else. Jesus doesn’t mean it literary, for these actions wouldn’t free us from our sin anyway, it dwells in our hearts. But He shows that even losing the most needed members of our body would be a small price to avoid the hell. We couldn’t possible consider God good and just and loving if He allowed sin to exist forever. There is no hope for Paradise if sin remains. Sin has to be destroyed. This is what the hell is about. God purifying His wonderful creation from all evil and corruption. It is the triumph of justice. It is the restoration of beauty and goodness of God’s creation. This is what Jesus as our doctor tells us. ‘You are going to die because of you sin.’ And this is where people get it wrong. They get offended or upset that someone has told them their true diagnoses. Diagnoses that matters not only for this life, but for eternity. This is what is wrong with us, we focus on this diagnoses as if it was the main message. We focus on a wrong part of Jesus’ message. Upset about diagnoses we don’t hear the most important part. “I love you so much, that I give up my life, my heart, myself so that only you can live. I have a solution that will bring you healing and life. Eternal life. Jesus Christ is your true Doctor, and your Redeemer. He gives His life in exchange to yours. He offers you salvation and life, rescue from the hell, He offers you His forgiveness – the only possible treatment to your diagnoses. But so often we have a wrong focus… Instead of looking at Jesus and rejoicing in God’s gift of eternal life, we are upset about diagnoses. This is how our sinful nature tricks us. If we needed to summarize God’s message to us then this is it. Everything was created very good. But then through disobedience of our first parents sin and death came into this world. Because the Triune God so loves His creation, He will purify it from all sin and evil, and He will restore its perfect goodness. But because He loves so much His little and rebellious creatures, created in His image, He wants to do whatever it takes, to rescue us from eternal destruction, He even gives up His life and creates for us a rescue path in Jesus Christ. This is why Jesus says: “I’m the way and the truth and the life.” This is Jesus message. This is what He tells you. Once we have a right picture of who the holy and eternal God is, how serious is our sin, once we get our focus right – on our Doctor, not on diagnoses, we can see that these words ‘sin’ and ‘hell’ are not hard anymore. They help us to see and appreciate even more what the Son of God, Jesus Christ has done for us and what He still does for us today. Do you know how the ancient church called the Holy Communion? The medicine of resurrection. This is what we have here today. We will receive the medicine of eternal life. The same body that Jesus gave for you, the same blood that the Son of God shed for you, to rescue you from sin and eternal destruction. He gives you this wonderful sacrament, so that you can rejoice in His message. In all its parts. So that we can recognize how serious our sin is, so that we can appreciate and rejoice in God’s plan to destroy all sin and evil, and be grateful for the life that Jesus Christ gives us. Don’t be ashamed of Jesus words, have the right focus – on our Divine Doctor, be loving and caring, tell others about their diagnoses and God’s wonderful solution that is freely offered and given to everyone.